A growing number of women who file for divorce say their husbands would rather spend their time playing videogames than playing with them. There are plenty of reasons to get a divorce these days. Maybe your man leaves crumbs on the counter every night and refuses to put gas in the car. Maybe he's a serial killer. Or maybe he just has a problem with videogames. A study conducted by Divorce Online has found that 15 percent of women who cite "unreasonable behavior" as the cause for their divorce filing point to videogames as the problem, saying that their husbands are more interested in spending time with games than with them. 15 percent may not sound like much but it's a huge increase over the previous year, when only five percent of women made the same claim. 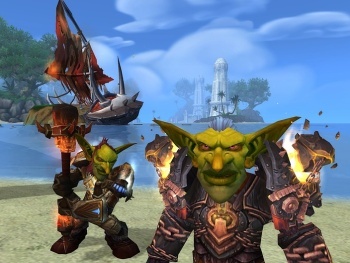 Unsurprisingly, World of Warcraft and Call of Duty top the list of divorce-causing games. "He was addicted to World of Warcraft but played other games now and then. The amount he was playing gradually increased until I could not take it any more," 24-year-old divorcee Jessica Ellis told The Daily Mail. "When it became serious he was playing up to eight hours a day. I was constantly trying to get him to cut back but he didn't think he had a problem until I told him I wanted to leave. But by that time it was too late." Videogame addiction expert Ryan G. Van Cleave said the troubles are compounded by the fact that most spouses aren't aware that videogaming can become an addiction, just like drugs and alcohol. "The reality is that with the proper professional support, a video game addict, like any other type of addict, can overcome the addiction," he said. The Mail also noted that "some" people claim that World of Warcraft is even more addictive than cocaine. Hyperbolic stupidity notwithstanding, Divorce Online Managing Director Mark Keenan was initially surprised by the numbers but expects it to be even higher next year. "The increase could be a consequence of people staying indoors more because of the recession," he said, "or it might be being used by men in particular as a means of escape from an already unhappy relationship." Call me crazy but I think he may be onto something.